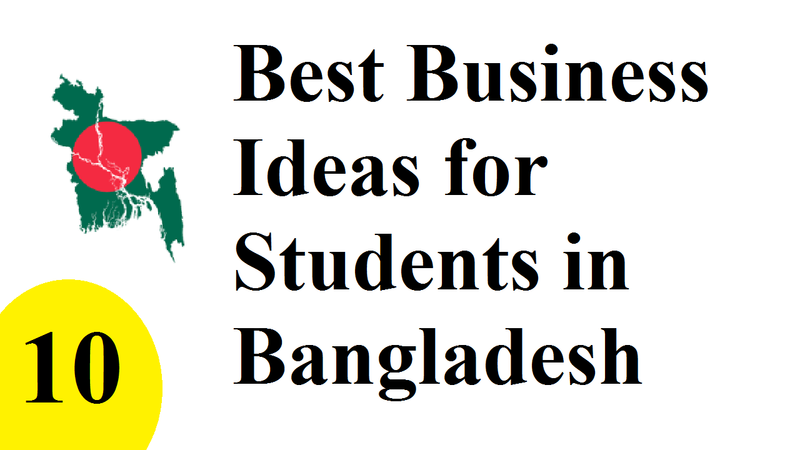 Here are 10 best business ideas for students in Bangladesh. You can start a side business as a full-time student and still keep up your good grades if you are a Bangladeshi student and you’re reading this article entirely. It means that you can start a part-time business as a full-time student and still keep up your good grades. So, we’ll talk about some of the best business ideas for students that they need not to stop their education due to lack of money. On the other hand, they’ll get the real experience of the idea that they’re passionate about. When the issue of running an own part-time business in school is raised, there are main three excuses that students are usually made. These are Time, money and the point or experience. Time: As the content is all about the best business ideas for students in Bangladesh, all of them are likely to be side or part-time business ideas. It means that you just need a few hours daily if you want to run your own business. Also, there are some ideas those you can operate during the weekends. Moreover, these are the times those you spend on trivial stuff. So, you can make your time effectively and create a beautiful and profitable future for yourself. Money: While working with a small business idea, you need not a lot of money. For some of them, for example, you need as lowest as BDT10, 000 to BDT15, 000 only. And this amount is nothing in this day. So, money and time nothing matter to start a side business as a student. What you need for this is that your commitment and hard work, that’s all. Read more – Ways to start a small business in Bangladesh. What are the Top 10 Best Business Ideas for Students in Bangladesh? As the students are the future of the country, the economic condition of our country hugely depends on them as well. Once they’ll lead the country along with their experience and hard work, but if they don’t earn the quality then the country will not be as developed as others are. So, let’s know about some top business ideas for students. This is not only very lucrative but can be initiated as a small-scale basis to start biscuit making business. This is because it’s a conventional activity and a student can initiate this business with low startup capital. Moreover, it’s expected a higher growth in the near future as the biscuit market is very promising. As a result, biscuit making business is one of the best business ideas for students in Bangladesh. As it’s a small-scale and part-time basis, any individual can initiate candle making business. Also, it’s one of the profitable and best business ideas for students as the people lighten candles for various purposes. They not only include the décor item of a house but for religious purposes as well. There is also a very potential market for scented and decorative candles apart from the traditional long white candle. In the jewelry industry, costume jewelry accounts for the highest market share. So, keeping a small stock, you can offer your products to the boutique retailers. But, you have to start selling them first in your own community. After that, you’ll head to the national level. As costume jewelry making business is one of the best business ideas for students in Bangladesh. Because of the era of designer dresses, the rise of designer lace making business has a great optimism. For this business, you’ll find a lot of machines on the market. When you’re in the business, you have to design your own pattern, colors of threads etc. and, finally, you have to make it great that consumers get enticed. Although this is thought as the women’s business, the business is for men as well. Also, you can start this business now if you’re a student of fashion designing. It means that the students who are from the fashion designing institutes, they can start the business easily. Those who are the students from Electrical & Electronics department, they can start the business of making fan regulator. Moreover, this is not only a home based business but demands very small capital to invest. That’s why it’s one of the best business ideas for students in Bangladesh. When you’re continuing this business, you’ll be able to make it a big business venture over the turn of time. This is not only mostly recommended but the most profitable business ideas for students as well. You can sell gift items just from your home, regardless you are living in the metro cities or rural areas. But, as all businesses require the quality products, gift item selling is also the same. Without attractive and good products you can’t go a long way. It’s one of the best business ideas for students to start a small ice cream kiosk. What you have to do for this business is that you need to keep some different flavors and blends’ ice cream in your shop. Also, while making aware of your friends and relatives, you’ll find it a good and profitable business. In the food processing industry, Jam Jelly Making is one of the best business ideas for students. You can start this business with a few numbers of equipment and tools. It requires nothing special but starting some different types of products and maintaining quality and hygiene. Starting a sports-related business is just perfect for you if you’re a college student and also a sportsman. This is because the games and sports industry offers several opportunities. And it’s one of the best business ideas for students that they can start with small or moderate capital investment.